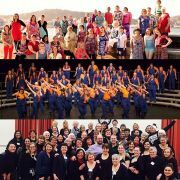 Added by Wellington City C.
Wellington City Chorus offers a contemporary, dynamic and distinctive style of acappella singing for women. We focus on education, and all ages and voice ranges are welcome. Come along any Monday and see what we do. We rehearse every Monday, 7pm - 10pm at the Wellington Bridge Club, 17 Tinakori Road, Wellington. If you're interested in more, join us on the first Monday each month when we welcome new faces a little more formally.